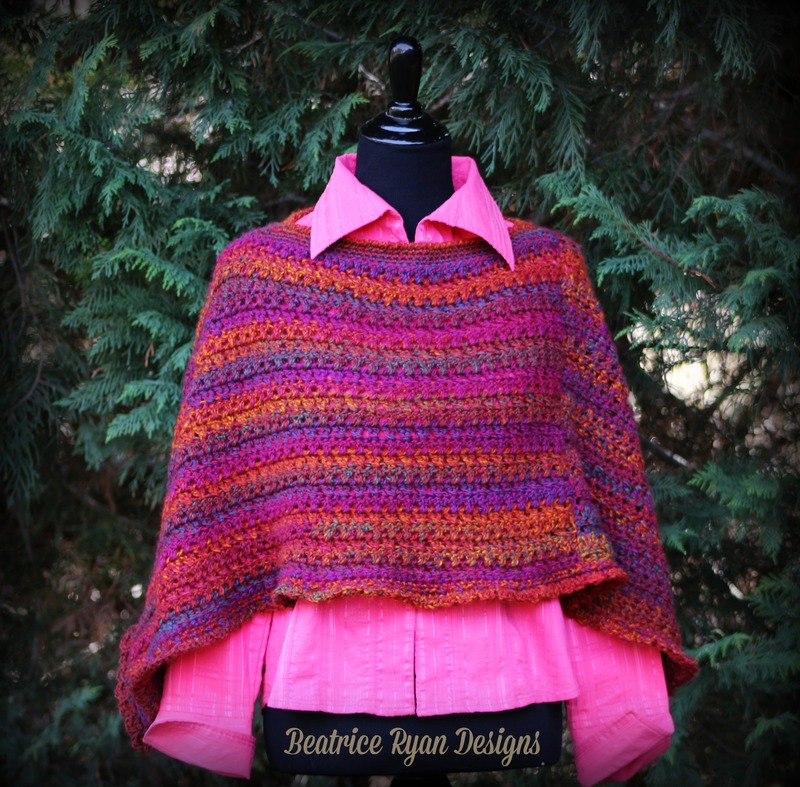 Are you a fan of fashion and comfort… If you are here on my site,,, I know you are a fan of Crochet,,, and Free Patterns!!! 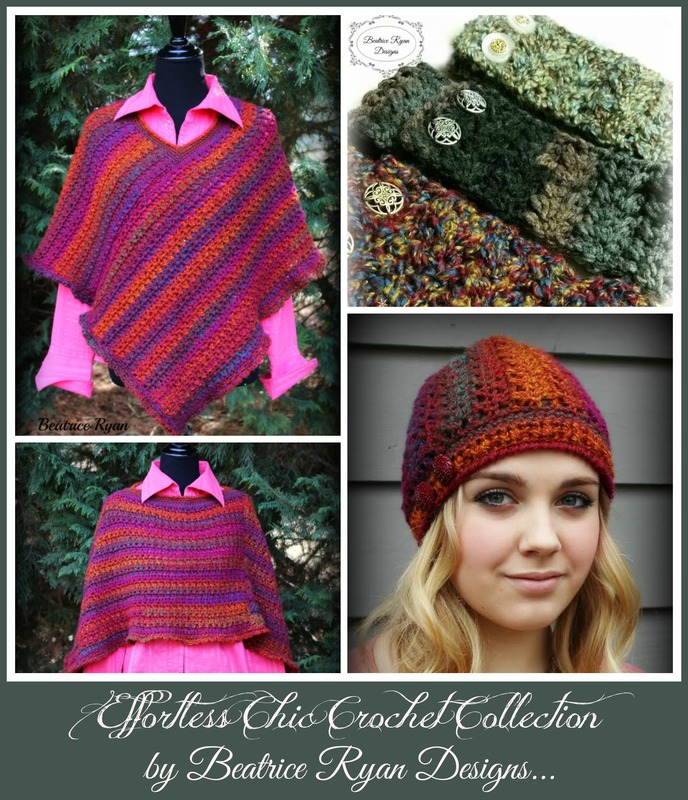 Earlier this week I published a new pattern as part of my new Free Pattern Series,,, Effortless Chic Crochet Collection! When I designed the first project in the series,,, I didn’t know I would do a collection… So I thought you may like to see the collection in one post… Here we go! Mix and match these for a great fashion look!! 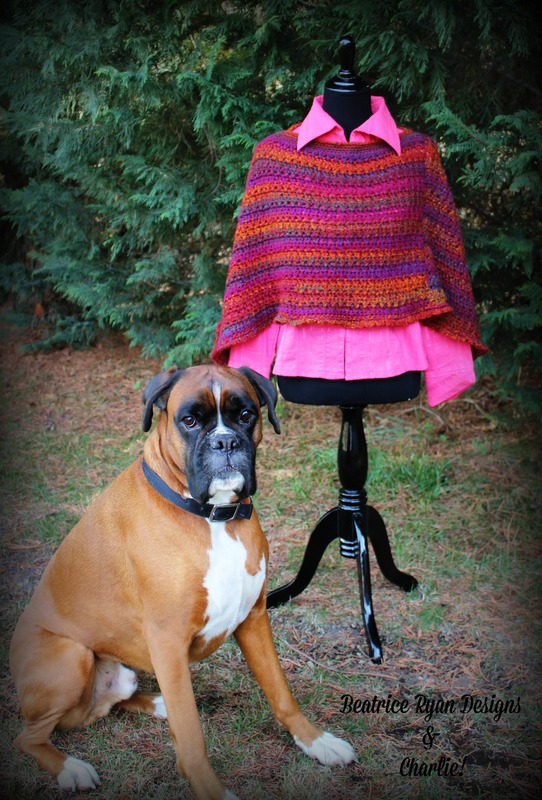 You can click on the links below to get your Free Patterns!! 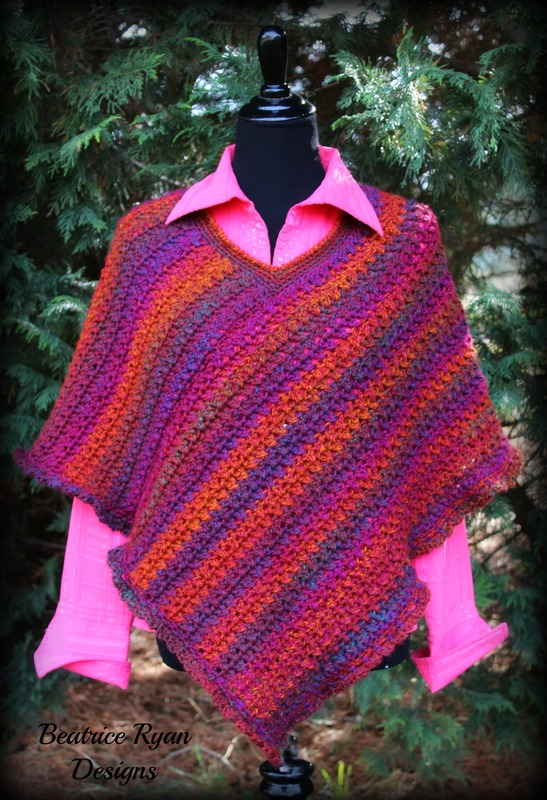 Effortless Chic Poncho… Click Here for the Free Pattern! Effortless Chic Beanie… Click Here for the Free Pattern! Effortless Chic Headband… Click Here for the Free Pattern! I hope you will make some of these fun patterns… I will be adding more to the collection soon..So stay tuned! A simple, yet classic poncho is a must for every wardrobe in 2015! Start your year off with the Effortless Chic Poncho!! The Effortless Chic Poncho is the 3rd pattern in this series,,, The same, simple stitching technique is used throughout the Effortless Chic line…. Worked in two rectangles that are joined to form a fun and chic poncho, with a classic neckline and edging.. 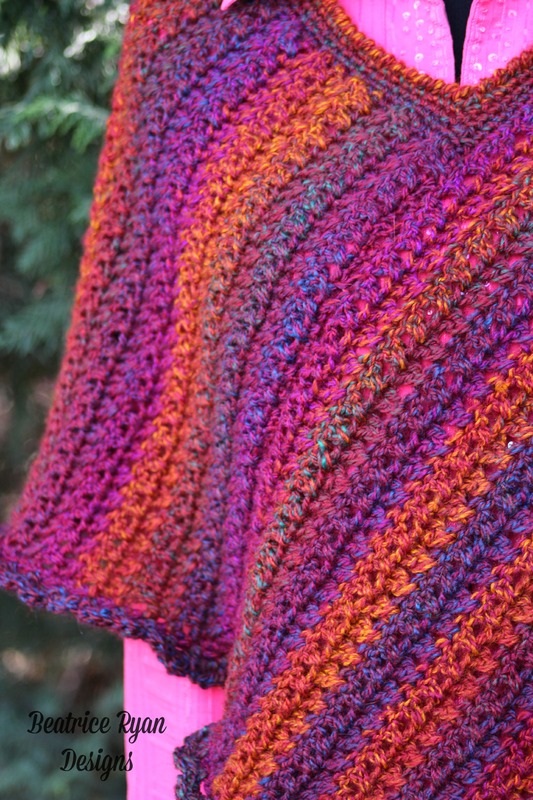 This Poncho will work up in just a few hours and be ready to wear on the next chilly day! If you LOVE this pattern don’t for get to add it to your Raverly queue and Favs!! Click Here…. The Effortless Chic Poncho will fit an average size woman and by using a larger hook and/or bulky yarn you can make this project larger! Yarn ~ 800 yards of Worsted Weight Yarn ~ Pictured here in Plymouth Yarn Encore Dynamo, Color 020 (This is a Self Striping Yarn). 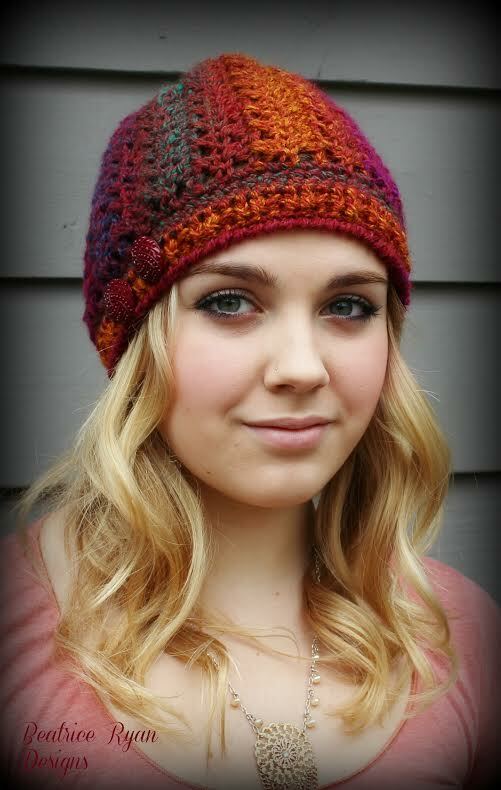 Buy a 5 pack now and make this project and the matching Effortless Chic Hat!! *Special Stitch ~ X Stitch, This stitch pattern is formed by Skipping a stitch, Dc in the next stitch and then crossing back to the previous skipped stitch and making another Dc.. This forms an X Stitch. 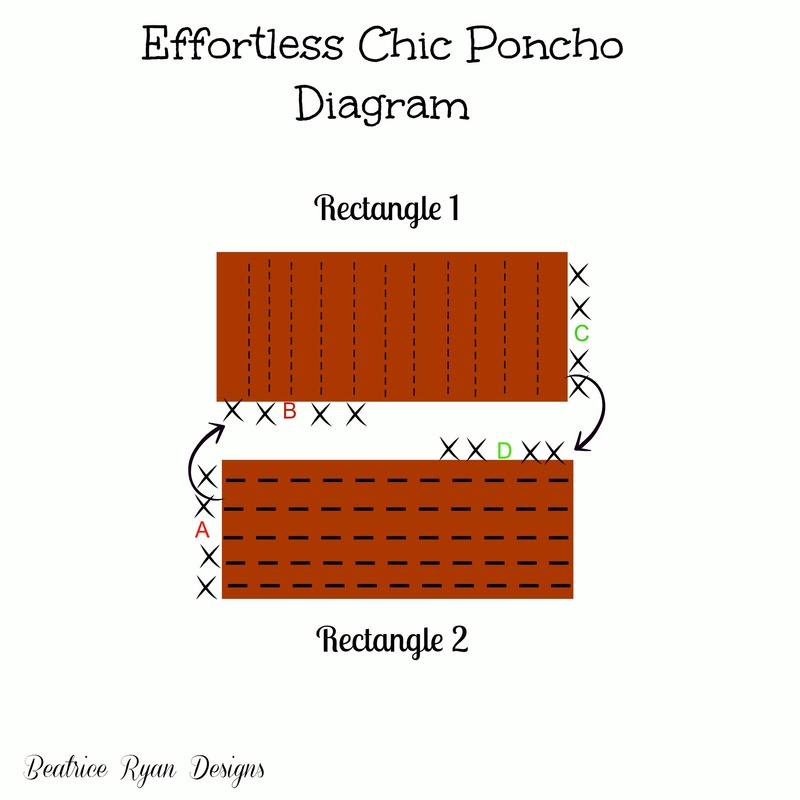 *Tip, You will be making two rectangles to form the poncho, working one horizontally and the other vertically… Once the rectangles are complete, you will sew them together to form a simple poncho shape… Don’t worry… There is a diagram to help you! 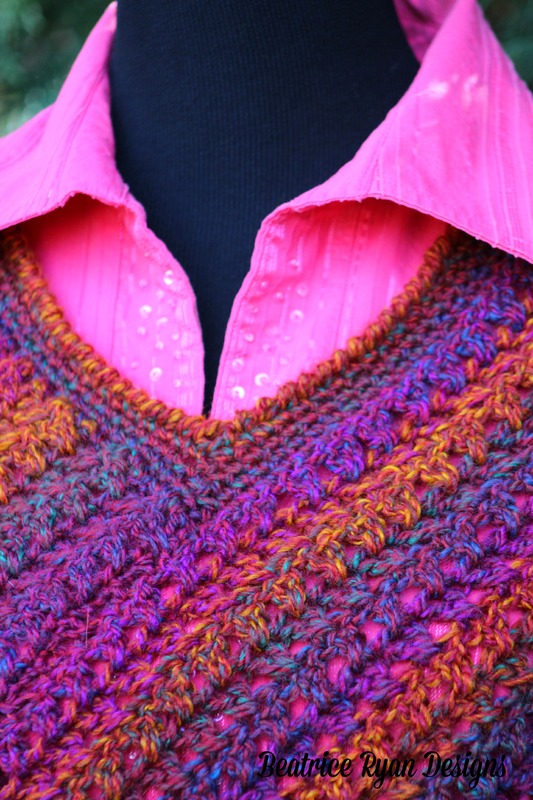 Once sewn you will crochet a simple neckline and edging to complete your project! Using a yarn needle and matching yarn, you will whip stitch the poncho into place… Sewing a short end of Rectangle 2 to the long edge of Rectangle 1 as seen in the diagram A is sewn to B and a Short end of Rectangle 1 to the long edge of Rectangle 2, C is sewn to D. Tip… Sew from the outside towards the inside to make sure the edges of the poncho stay flush. Row 5: This row is worked in Reverse Sc. Ch 1, Sk first 2 Sts to your right (this is the “v”), Reverse SC in the next 40 Sts, Sk 2 Sts (this is the second “v”), Reverse Sc in the next 40 Sts. Join with Sl St to beginning. Finish off. Row 2: Sl St in the next St, Ch 1, Sc in the same St, * Ch 2, Sk next St, Sc in next St*, Repeat * * 68 times. (Your last Sc should be in the Center St of the 1st point)., Ch 2 Sc in same St, *Ch 2, Sk next St, Sc in the next St*, Repeat * * 68 times,(This last Sc should be in the center of the 2nd point), Ch 2 Sc in same St, Ch 2, Sk St and Join to beginning. = 140 Ch 2 Spaces. Row 3: *3 Dc in the next Ch 2 Sp, Sl St in next Sc* Repeat * * 67 Times, 5 Dc in next Ch 2 Sp (this is the 1st point), *Sl St in next Sc, 3 Dc in next Ch 2 Sp* Repeat * * 68 times, Sl St in next Sc, 5 Dc in next Ch 2 Sp (2nd point), Sl St in next Sc, 3 Dc in next Ch 2 Sp, Join With Sl St to last Sc. Finish off. = 138-3Dc shells and 2-5 Dc Shells. Congratulations!!! You now have your own Effortless Chic Poncho!! And of course the usual Photo Bomb of Charlie!! 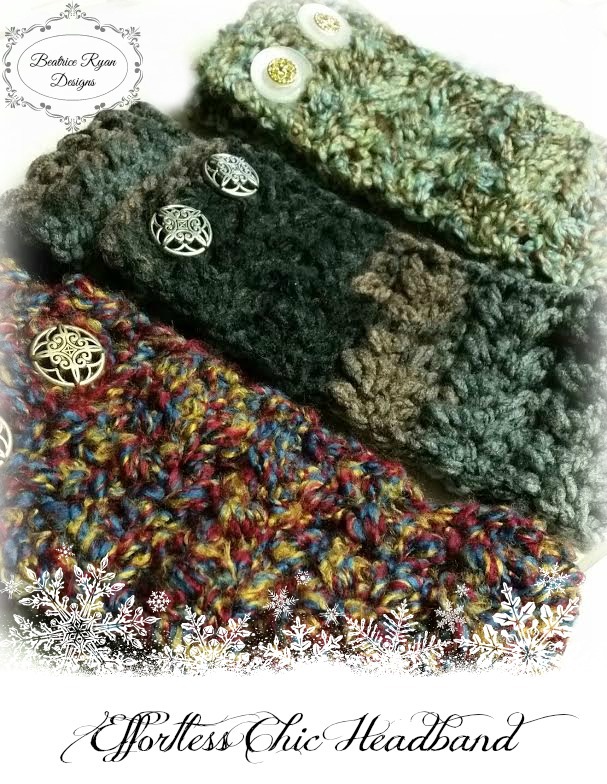 My last HOTH (hot off the hook) project for 2014… I made these 3 last night!! Effortless Chic Headbands ready for the chilly weather!! This is a quick (30-45Min) Project, One Skein and a couple cute buttons!! What will be your last HOTH??? Stay tuned this weekend for my first post of the New Year!!! Crochet With Me Winter CAL… I have my yarn and the design started!!! I will be posting the Materials list and a few details of the new project! !